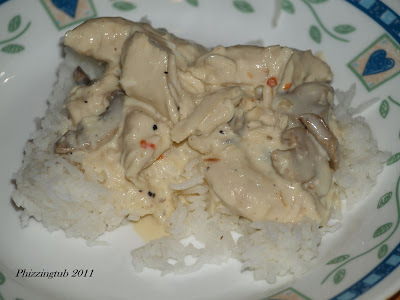 Fast, easy, creamy and totally delicious is this chicken crock pot recipe. What can I say it was a huge hit in the house the only item I would change is to use spaghetti noodles instead of rice. I opted to try for the rice because we were a bit short on time due to it being a hockey night. You will have one big hit on your hands with this recipe. Chicken tenders about a pound and a half instead of the four chicken breasts - not a drop left over. Place the chicken in a crock pot. Combine salad dressing mix and water; pour over chicken. In a small bowl, beat cream cheese and soup until blended. Stir in mushrooms and pour over the chicken. Cook 1 hour longer or until meat thermometer reaches 170 degrees.